Leo is the most dominant, spontaneously creative extrovert in the Zodiac. The king of beasts is ambitious, courageous, dominant, strong willed, positive, independent, self-confident (there is no such a word as doubt in their vocabularies), and they self-controlled. Born leaders, they are either in support of, or in revolt against, the status quo. They are at their most effective when in a position of command, their personal magnetism and innate courtesy of mind bringing out the best of loyalty from those who serve them. These individuals are uncomplicated, knowing exactly what they want and using all their energies, creativeness and resolution to get it, as well as being certain that they will get whatever they are after. Leos go where angels fear to tread! 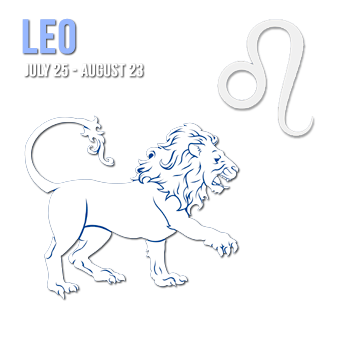 On the whole Leos are powers for good, being strongly idealistic, humane, and beneficent. One outstanding trait is powerful intelligence. They can be of a broad philosophical, sometimes religious, turn of mind. Those who are devout may become very obstinate in advocating traditional beliefs and will cling tenaciously, but in a completely sincere manner, to practices and doctrines liberal thinkers would regard as oddly out-of-date. These are more than likely considered the 'lions' of industries, and in the forefront of cutting edge of technologies. Everything for Leo is larger than life and their faults can be as large scale as their virtues. One of the most unpleasant beings is an excessively negative Leo full of extreme arrogance, haughtiness and excessive temper. Jealousy can color their world an ugly shade and even imagined rivals are in for a rough ride. They will not hesitate to use cunning, lies and trickery to discredit someone they feel is an enemy real or imagined. Self-centered, they can be greedy for flattery, boastful and full of bombast, pomposity and snobbish superiority. Leo can have intolerable disdain for underlings to whom they will delegate many minor details in some grandiose scheme. They will feel no guilt "borrowing" ideas from others when they wish to appear better than they are. Luxury is a passion for the Leo individual as well as a lust for power at any level. It is mainly uncontrolled impetuosity that could be their downfall but rarely does Leo give way thoroughly to this list of vices and there is usually a balanced and innate wisdom that will come shining through. Those afflicted with any or all of these vices are usually intelligent enough to take action to overcome them. Leo does well at any vocation where there is room at the top. As politicians they are content with nothing less than a powerful position in government. In business they may be the chairman of the board, or at least a director or senior manager. Excellent organizers and overseers, they can often be found laying the groundwork for new projects. Leo dislikes manual labor preferring to take charge of others doing it so will be seen aspiring to become the boss revealing their ambitious nature. (Tom Sawyer had to have been a Leo.) If artistic, Leos can become stars of stage or screen (their focus is more on the serious side as opposed to light drama), maestros as musicians where they will gravitate toward the grand instruments or activities, such as the organ or conducting orchestras. As painters; anything grand in conception and scale appeals to them. Leo women make exceptionally good welfare workers.